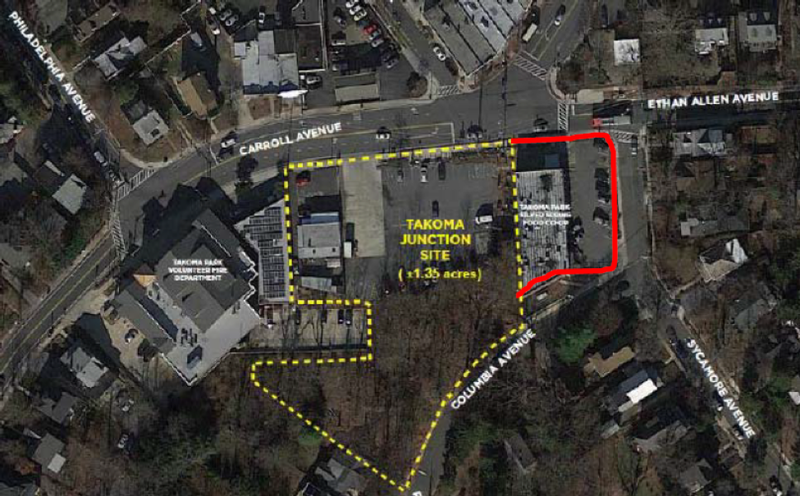 The developer, NDC, is slated to present its new draft site plan to the Takoma Park City Council on April 4th. Discussion of the proposal will take place at the April 11th, April 18th, April 25th and May 2nd Council meetings. The final vote on whether to approve the project will take place on May 9th. Takoma Park, Maryland abuts DC and has three commercial areas. 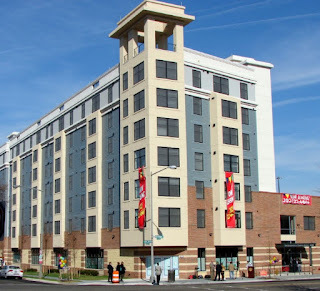 Two are "traditional, Old Town next to DC and Takoma Junction about one mile away, and anchored by the Taioma Food Cooperative, and traditional "sprawl" type retail along University Boulevard and New Hampshire Avenue, on the border with Prince George's County. Takoma Junction isn't particular successful, other than the Food Co-op, because it doesn't have a lot of nearby population--Takoma Park is mostly single family residential with comparatively big lots, so other than the Co-op, a gas station and auto repair place, there isn't a lot going on there, and other retailers don't tend to last. One of the best buildings is occupied by Historic Takoma, which does a nice job of sponsoring presentations and other activities in their space.. 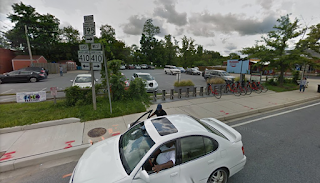 Between the Co-op and Takoma Auto Repair is a "large" parking lot which the City has owned for a couple decades and has tried many times to redevelop. 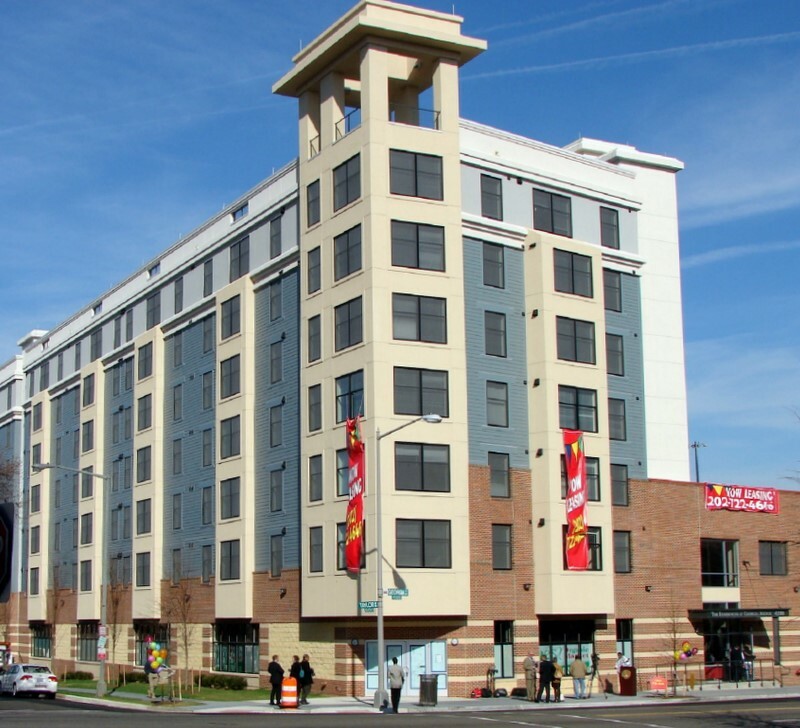 The most recent process featured an RFP process which was won by a DC-based developer, Neighborhood Development Corporation, known for small developments across the city. The parking lot (Google Street View image). The Food Co-op bid on the project, but their proposal wasn't chosen. Since then, they've engaged their supporters to challenge the development project at the Takoma Park City Council level. 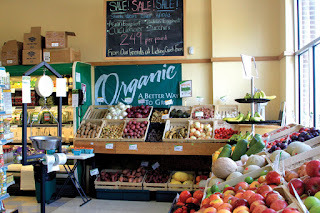 Great cooperative grocery stores exist -- just not in the DC area. It's hard to believe in the DC area, but in places like Seattle and Minneapolis, food cooperatives are thriving alternatives to traditional grocery stores. By contrast, the Takoma co-op is more a big corner store that sells natural foods and the Greenbelt Food Cooperative is more like a traditional independent grocer (think IGA but with the Coop brand). The newly constructed People's Food Co-op, 519 1st Ave. S.W. in Rochester, Minnesota. The store is open 6 a.m. to 10 p.m. daily. Photo: Elizabeth Nida Obert, Rochester Post-Bulletin. Food cooperatives are part of mixed use developments. In Seattle alone, four PCC (Puget Consumers Coops) are topped by housing: in Columbia City (a revitalizing neighborhood); Fremont; Greenlake Village; and West Seattle. PCC is adding a fifth mixed use location Downtown--and will have a 20,000 s.f. store in a 58-story mixed use building ("PCC will put grocery in heart of Seattle's Downtown," Seattle Times). 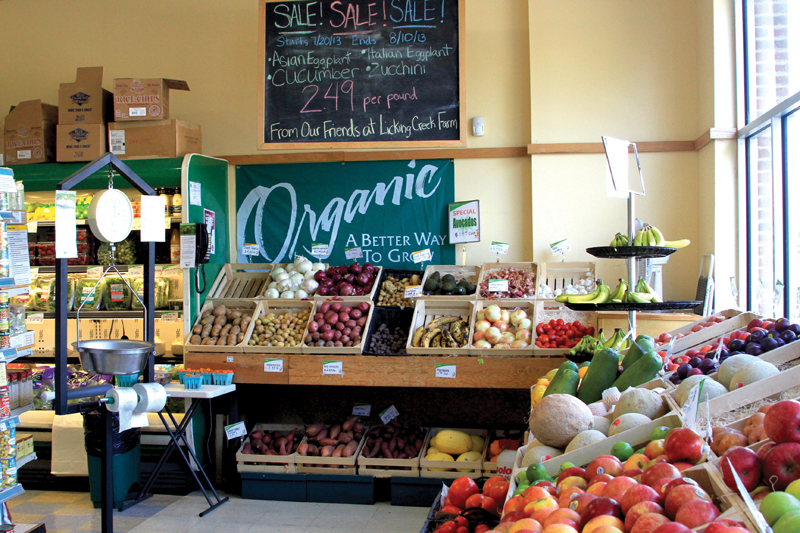 Central Food Co-op's store on Capitol Hill has been on the ground floor of an apartment building for almost 20 years. A four-story, block-long structure, Commons at Penn will house 45 units of workforce housing, a host of community amenities and the 4,000 square foot Wirth Cooperative Grocery Store — MSP’s newest grocery co-op. Watson-Forsberg and LHB Corporation are co-developing the project. 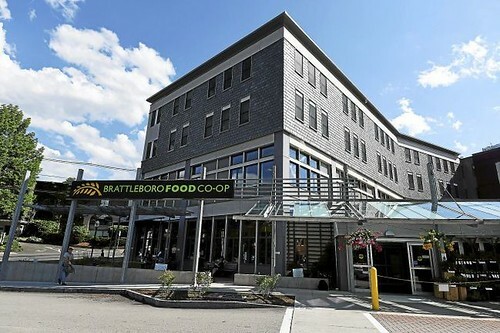 The character and commercial center of downtown is poised to further shift as a new, roughly $15 million mixed-use development at the top of Bridge Street will — in roughly a year and a half — feature an expanded, 14,500-square-foot Berkshire Co-op Market along with retail, office and 22 residential units above it. 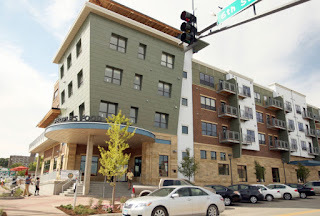 The four-story, highly energy-efficient, green building provides 33,600 square feet of retail and office space for the Co-op on the first two floors and 24 affordable apartments in the top two floors. 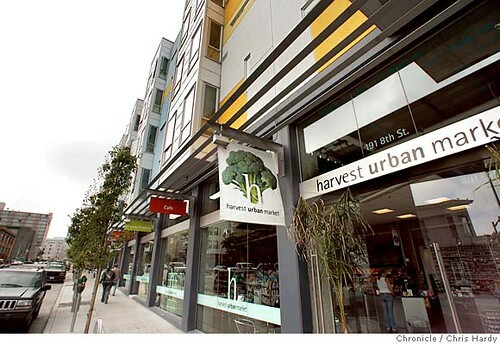 While it is an independent grocery store run as a for profit, the Urban Harvest Market in San Francisco anchored an affordable housing development in the SoMA district, almost a decade before the area became a super-hot real estate market ("A SOMA complex with a coffee shop and lively mural proves that affordable housing doesn't have to be ugly housing," San Francisco Chronicle). "We approached this like we were doing a house for Larry Ellison," says David Baker, the architect for the one-acre complex that also includes 74 family apartments framing a private terrace where children can play. "It's important when you do a big piece of the city that you make sure to enhance the environment. Future generations have to live with it." Of course, increasingly in cities generally and in the DC area specifically, for profit groceries like Giant and Safeway have been built as part of multistory apartment and condominium buildings. The new project moves forward, presuming not much will happen with the Food Coop as a store or a site. Meanwhile Neighborhood Development Corporation continues to move forward on the project, and proposes a "small" three story building, abutting the Co-op, even though a combined project would make more sense, were the Co-op cooperative. Why not start over and combine? By combining the two separate sites, all the parking could move underground and the Food Cooperative could have a flagship facility that would make it and Takoma Junction a destination. Possibility of financing from the National Cooperative Bank. Plus the project would probably become eligible for financing from the National Cooperative Bank, lowering the cost to finance. Produce section at the Takoma Coop. Photo by Amanda Smallwood. Grocery stores don't pay market rents so cross-subsidy is key: make the building taller. 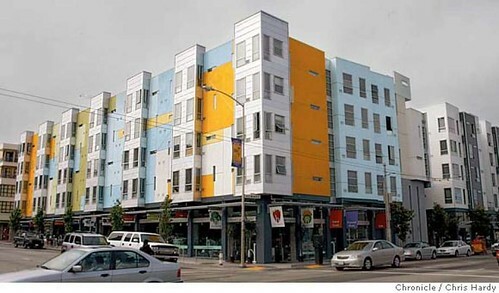 If the building is made taller, four or probably five stories would be best, then the Food Coop could be guaranteed a permanently "lower" rent, being cross-subsidized by the additional development from one or two additional floors. This is in order because grocery stores typically pay much less than standard retail rents because grocery sales margins are extremely low--less than 5%--and because the stores are anchors, drawing customers which are shared with nearby businesses. A cooperative in New Haven ended up going out of business because they agreed to rent increases as sales increased even though they made only a few cents per dollar of sales. Rent increases were larger than the small increase in profits from greater sales ("Elm City Market auctioned off," Yale Daily News; "New Haven's troubled Elm City Market faces 'friendly foreclosure," New Haven Register). Map of site from the Greater Greater Washington post, "Why is a small grocery store blocking a Takoma Park development projecdt more than 20 years in the making?." Another option: use of subterranean space. Another way to reduce rental costs for the co-op would be to shift most of it to a basement location with a ground floor section and entry. This is a way groceries get around what normally would be higher rents. In DC, most of the Whole Foods Supermarket in the Foggy Bottom neighborhood is located in underground space. The new Trader Joe's on Capitol Hill is fully underground, except for a ground floor entrance. The advantage to a developer is it makes for profitable use of what would otherwise be unmonetized space, making the project more profitable. In this case, it would allow for the ability to maximize the amount of retail space between the basement and ground floor making the project more transformational and strengthening the commercial district even further. And NDC has already done a similar project on Georgia Avenue NW in DC called the Residences at Georgia Avenue, where a Yes! Natural Grocery is on the ground floor of an affordable housing apartment building. Personally, I don't think the ground floor design adequately reads "retail" and the store is pretty small, but otherwise it is an example from the developer's own portfolio. The developer might not want to delay the Takoma Junction project which has been going on for awhile, but the potential sweetener of a bigger, better building, and financing from the National Cooperative Bank ought to make such a choice more palatable. It's important for another reason. The site will be developed on a 99 Year Lease. That's three generations. If you don't get it right at the outset you're stuck with it for the next century. The NDG project is decent. But it isn't transformational. Produce section, Puget Consumers Cooperative, Fremont neighborhood, Seattle. 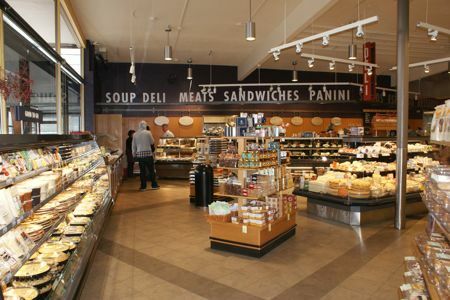 Deli section at the smaller West Seattle branch of the PCC. Considering how long the site has been undeveloped, taking a little more time won't hurt anyone. And considering that it has already been waiting 20 years for redevelopment, a couple years more won't matter, and will be worth it if it results in a great food coop instead of a run of the mill one, and a much more successful project overall and a way better Takoma Junction. PCC in Seattle "is the first retailer in the country to comprehensively address broiler chicken welfare — not only for fresh and frozen chicken but also ready-to-eat chicken products."